St. Louis Police arrested 80 people last night during a third night of violence in the city. 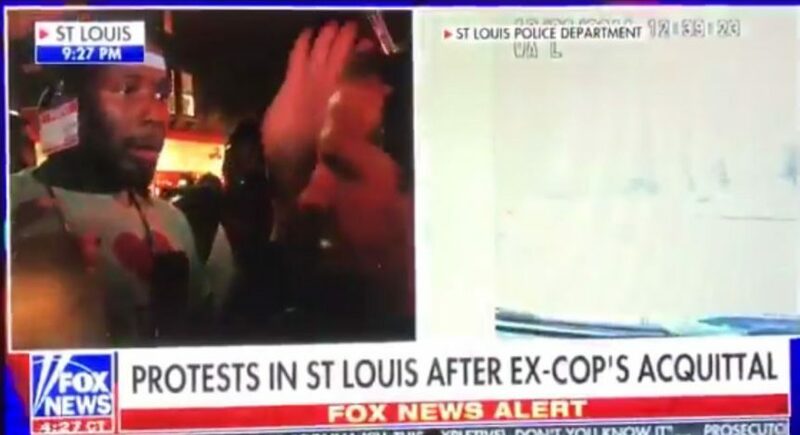 Several journalists were also briefly detained during the protests, including Fox News reporter Mike Tobin. Tobin has been covering the protests since the acquittal of Jason Stockley, a white police officer who shot and killed Anthony Lamar Smith, who is black, following a high-speed pursuit in 2011. On Friday night Tobin was interviewing one protester when another poured water over his head. He took it in stride, tweeting later “I’ve been wetter.” In fact just last week, Tobin, who is one of Fox News’s most senior correspondents, was reporting from Florida covering Hurricane Irma.